Strawberries (Fragaria x ananassa) are prolifically producing plants that thrive in U.S. Department of Agriculture hardiness zones 4 to 8, a range that takes in all but the coldest parts of northwest Wisconsin. With proper care and careful selection of a cultivar, gardeners throughout the state can produce a crop of summertime berries. Strawberries may be of the June-bearing, ever-bearing or day-neutral types. June-bearers produce a single crop of berries in June or July. Ever-bearers produce a crop in late spring and another in early fall. Day-neutral varieties produce fruit continuously through the season. June-bearing varieties are most often planted in Wisconsin, and many different cultivars are suited to growing throughout the state. Among June-bearers, "Crimson King" is especially hardy and will do well in the northern part of the state, which extends down to USDA zone 3b. Among ever-bearers, "Ogallala" and "Fort Laramie" are recommended for northern Wisconsin, while "Ozark Beauty" will do well anywhere in the state. Most day-neutral cultivars are not winter-hardy in Wisconsin and will need to be replanted each year. Strawberries need full sun to produce an adequate crop of berries. Plants should be cultivated in a location that gets at least six hours of sun a day, but ideally they should get at least 10 hours of sun per day if they're expected to produce to their full potential. Avoid planting strawberries in locations where you've previously planted raspberries, blueberries, tomatoes, potatoes, peppers, eggplants, cucumbers or watermelons. 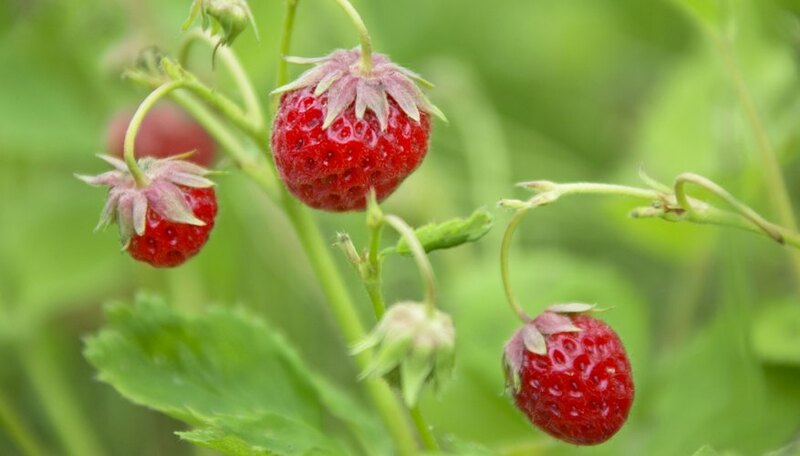 These plants are often carriers of diseases to which strawberries are susceptible, and your strawberries may be infected by soil-borne pathogens. Soil in the planting bed should strike a balance between moisture retention and quick drainage, since strawberries will tolerate neither drought nor soggy soil. Mixing peat or organic compost into the soil will help to improve its composition by loosening the texture of clay soils and adding moisture-retentive material to sandy soils. Adding 1 to 2 pounds of a 10-10-10 fertilizer per 100 square feet of planting area will provide supplemental nitrogen and help young plants to get off to a strong start in their first season. Strawberries are typically planted using either a "matted row" or a "hill" planting system. In the matted row system, plants are spaced 18 to 24 inches apart in rows that are about 36 inches apart. As the plants grow and send out runners to produce new plants, the "daughter" plants are allowed to grow and fill in the row until a solid matt of plants is formed. In the hill system, plants are spaced 12 inches apart, and runners are cut off so that they don't produce new plants. The matted row system is best suited to June-bearing varieties. The hill system works better with ever-bearing and day-neutral varieties. Whichever system you use, set plants as early in the spring as possible, as soon as you're able to work the soil. Setting the plants at the proper depth is crucial; the plants must be positioned so that their roots are completely covered by soil, but the crown, the part of the plant from which the leaves emerge, must not be buried. After the plant is set, firm soil around it and water thoroughly. After planting, strawberries need about an inch water per week, so you should provide supplemental irrigation if there's not enough rainfall to meet that need. Strawberries are not especially sensitive to frost, but they may be damaged if the temperature falls below about 18 degrees Fahrenheit during a late spring freeze. If the weather turns cold, mulch around the young plants with 2 to 4 inches of straw to protect them.